This book provides background and rules for the Western Church as a human institution, covering the organization of dioceses, monastic orders, and daily devotion. 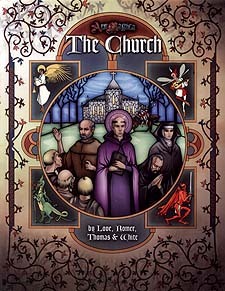 It also describes the role of women, and looks at the Knight Templar and Franciscans in more detail. As a human institution, however, the Church is not immune to corruption, and so this book also discusses how some of the great orders of the Church might fall to the Infernal. Bring the faith of your charactes to life.